The Shire of Tammin covers 110,090.4ha and was cleared early in European Settlement. Today less than 4% native vegetation remains. The Government of the day set aside areas of native vegetation and nine Nature Reserves were identified ranging in size from 24ha at Bungulla Nature Reserve to the 799ha Charles Gardner Nature Reserve situated 15km south of Tammin. Charles Gardner Nature Reserve was classified as an ‘A’ class conservation reserve in 1958 and is a floristically diverse nature reserve of value both botanically and historically. The Shire is drained by a branch of the East Mortlock River which exists as salt flats in the west of the Shire. The Tammin LCDC, formed in 1985, has endeavoured to reverse land degradation problems with assistance from several programs. The ALCOA Landcare Project was launched in 1990 and South Tammin Catchment Group has been actively involved with this project which aims to increase land reclamation through the establishment of on-farm demonstrations. Most of their landcare demonstrations are at a mature stage and provide visitors with the opportunity to hear from farmers, about the costs and benefits of different approaches such as minimum tillage, beef on tagasate and improved pastures. Catchment Groups within the Shire have also been involved in several Natural Heritage Trust Projects, the largest - 'Branching Out Big Time'. The project decided that a program of accelerated revegetation, encompassing the whole district, was required in order to have an impact at a landscape scale. More than a million trees and understorey have been planted with 300km of fencing to protect remnant vegetation and revegetation has been erected over the three years of the project. 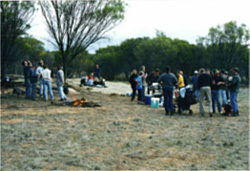 Community Projects such as that held on land adjacent to Yorkrakine Rock to extend the Nature Reserve by planting native vegetation and creating habitat are just one of the many activities where local people get together to protect and preserve the diverse range of natural heritage in the Tammin Shire. Tammin Landholders are committed to ‘sustainable agriculture’ into the future.